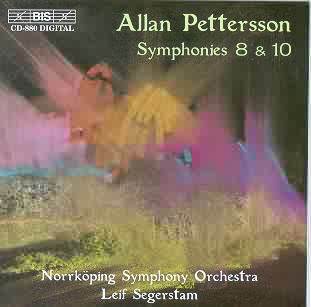 While the CPO cycle of Pettersson Symphonies has positively rushed onto the scene and is now almost complete. The BIS cycle has progressed at a steadier more Petterssonian pace. This has been previously recorded first, by pioneer conductor Sergiu Comissiona on a Polar/DG LP (never reissued) and then on CPO. It was premiered in Baltimore in October 1977 and the Baltimore orchestra recorded the LP. Pettersson's Bach-like chorales are a trademark of his: a fingerprint. They are prominent in the eighth symphony. A long calmly confident line expands freely and stretches its wings across the massive framework of this two-part (20 mins + 26 mins - separately tracked) symphony. Disquieting shudders squeal and chatter. The climaxing long lines (4:46) remind me of Rubbra's symphonic writing. Pettersson is a strongly lyrical composer and it is that lyricism (close to Vaughan Williams and even Hovhaness sometimes!) which predominates. Little surges, shudders and currents disturb the calm, opening casements onto nightmare scenes. Segerstam keeps the action fluid and defies the temptation to sink into meandering. The second section is two minutes longer than the 10th symphony. There is a higher conflict quotient here. This movement is also the most difficult to come to terms with by comparison with the unendliche melodie of the first. The symphony ends in character with the raw eldritch lyricism of the closing of the seventh symphony although the theme is not as distinguished as that in the seventh. The symphony fades down the gentlest of gradients to a niente close. This too has been previously recorded - most recently on CPO with the Hannover Radio SO and Alun Francis. The Segerstam is a minute and a half quicker and you feel this invigorating acceleration in the first 10 minutes of the symphony where Segerstam keeps pressing forward almost impatiently. Strangely I soon began to wonder about Segerstam's approach and now lean in favour of the Francis on CPO. Frankly though, either will satisfy and neither strikes me subjectively as a distortion or unrepresentative. The booklet cautiously recounts a possibly apocryphal story that sections of this symphony were written out on bandages and dressings which became part of Pettersson's daily life from the fifth symphony onwards as arthritis took its appalling toll. From 18:29 the great chorale arrives lifted and bludgeoned by chattering and violence and it is the violence which triumphs. This is a work of hectoring gestures. Stig Jacobsson's notes (English, German and French) are excellent giving useful solid factual details and blessedly non-existent in describing musical technicalities. I wonder how Bis are planning to handle the remainder of the cycle. They really ought to beat everyone else to it and record the surviving fragments of numbers 1 and 17. Are either able to be completed by Segerstam who is of course a composer as well? Also will they re-record No 5 previously recorded in a version conducted by Moshe Atzmon and the Malmö SO? A fine addition to the Pettersson discography balancing a short symphony with one of Pettersson's more monumental scores. I can hardly wait for Segerstam to tackle No 9. Please Bis record that one next coupled with either 1 or 17.